Global weather chaos - is it connected? (CNN) Millions of people in Pakistan have been devastated by torrential flooding, wildfires in Russia already claimed more than fifty lives, a massive ice island four times the size of Manhattan has just split from Greenland and now Germany, India and the Czech Republic are falling victim to the wrath of mother nature. The extreme weather around the globe in the past week has already killed more than 1,500 people and the situation is only worsening for a number of countries in Europe and Asia. Flash flooding in Germany, Poland and the Czech Republic over the weekend left nine people dead and thousands have been evacuated from towns and villages along the border. On Monday, water levels started to ease off, but there were fears that fresh rain on Wednesday could inundate the regions already swollen rivers. In China, heavy rains turned hillsides into rivers of mud as landslides killed more than 120 people in the northwest of the country. More than 1,300 people are still missing from the disaster. In neighbouring India, rescue workers searched a town in the north of the country after flash flooding and landslides killed 145 people and left hundreds more missing. While this was all happening over the weekend, Pakistan tried to recover from the worst natural disaster in the country's history. Ahmed Kamal, spokesman for the Pakistan Disaster Authority, said 1,203 people are confirmed dead across the country, and 1,317 have been wounded. About 288,000 houses have been damaged, and more than 278,000 people have been rescued. At least 12.2 million people have been affected by the torrential rains and floods, Pakistani authorities said. Scientists are also scrambling to find out why a massive ice island the size of 48,000 football fields broke off a glacial ice shelf in Greenland. The iceberg has enough fresh water to supply the U.S. population for 120 days. Climate change researchers are arguing that these events are all connected because of global warming, but could they just be a random series of events that just happened to occur in the same week? Do you think these weather events are connected? Is global warming to blame? We want to hear what you think - please leave your questions and comments below and if you want to voice your opinion on CNN television, please let us know and we'll get in touch. Yes, some day, if we all just do as the hysterical mainscream media says, our climate willl be like it should be or used to be, like the inside of an indoor shopping mall. Mother nature fights back to warn mankind of the greatest disease to inhabit the earth. Global weather chaos – is it connected? Yes it is connected. We all should be concerned about what is coming .Media channels like CNN should not IGNORE bad news from affected locations also don't project unnecessary PANIC. More global changes will come in coming years and everyone on this planet will be affected by them.That is signal to mankind to start to make changes . Otherwise we will be wiped out from this beautiful blue planet. Hope we are able to achieve this and coming events will consolidate mankind around the globe. While it's interesting to see so many tragic weather-related disasters in a single week, I have to wonder if this sort of frequency has ever been seen in previous years. Though to be fair, the forest fires in Russia (being started by accidents rather than weather) seem to be happenstance. If this really is a statistical outlier, then I wouldn't doubt that there is some credence in connecting the events to a global warming trend. It's also unfortunate that the hardest hit countries (Pakistan, India, Russia, etc.) are the least prepared to cope with them. Certainly these events are all connected to man-made damages to mother Earth and environment. I think reckless damages to nature will certainly wipe out the humanity one day and the day is not far off. Man can not fight the nature's fury. Man has to understand that they have to live with nature. That's what was the understanding over the ages. But today we are causing so much damage to the nature how long it can put up with it. All the experts, all the politicians, all the religious leaders and everyone else once knew for certain that the earth was FLAT. Now we are supposed to believe that man is responsible for global warming on a planet consisting mainly of molten rock. I for one have not seen any evidence linking man with global warming, only people repeating what they have heard from someone else. Mostly it’s about revenue generation and budget justification. Well we have soon used up all the Oil, what we gona do witht the planet with no Oil anyway ?? Sit at home and count the corn (if you have some left). Aha you have no corn because its burnt in the fires or droughts or floods ? These sorts of extreme weather and resulting natural disasters are pretty much what global warming experts have predicted all along. I think what is critical is that we need to start recognizing that global warming does exist and is causing these extremities. It doesn't matter whose "fault" it is; it may simply be cyclical and not affected by mankind at all. But we need to prepare for more and more extreme weather. Global warming prognosticators predict harsher winters and hotter summers, bigger more destructive storms of all kinds, floods in some areas and droughts in other places. We can continue to be "shocked" when these events occur, or we can start putting some mechanisms into place to deal with them. It's better to be prepared than to simply throw money at it when it happens. Continuous massive disasters can destroy the global economy just as quickly as failing banks. Sticking our collective head in the sand is not the answer. – Solar activity has been muted for years now and just began picking up again the last few weeks. – Sunspots are on the rise again which will affect the earth. – Large planetary alignments are occuring now. – Not hard to believe all these thing will affect the earth, since we experience that everyday with the Moon as an example. So the occurrence of all extreme weather events now may just be coincidental, but they may also be further indicators of the impact of the warming Earth. NOAA and NASA have both reported the year to date to be the hottest on record worldwide. A hotter planet will have more, and more extreme, heat waves, and because a warmer atmosphere holds more moisture, heavier rainfall when it does rain. So while it may not be possible to say global warming has caused these events, they are entirely consistent with a warming world and likely have been exacerbated by the fact that it's hotter than it used to be. Well you could say just about anything that's humanly possible. * How can the rain go away when we have built on all of the land which would normally take away the rain. * We have pumped billions of barrels of oil out of the earth in a few hundred years, What goes into this deep hole once the oil has been removed ? * With 7 Billion people on the planet if the oil runs out then how can we feed so many people ? * Its not just a question of Climate change its a question of our selfishness to the future generations IF ANY ?? What everyone does today is to talk , talk, talk, there is nothing else that can be done, Politicians cannot do anything, Activists cannot do anything. The World is to advanced ( in most areas) and there is no control, really I care about what happens to the Planet, but nor I nor the Highest powered people of the World can stop what will happen to this Planet. Its just a matter of WHEN ? The climate models have predicted that as the amount of CO2 in the atmosphere approaches 400ppm- there would be events and tipping points that would begin to occur. (We are now at 390ppm) increasing by over 2ppm a year- we should reach 400ppm in less then 5 years. Weather events in themselves cannot be said to be caused by global warming- but a number of extreme events; heat waves, floods, arctic ice melt, droughts, and extreme storms are all predicative of climate change. I have been saying that this type of situation would happen for 10 years. For those who think events in Pakistan or Russia or China will not affect us-you are certainly misinformed. Just one example: Russia has cancelled all outgoing grain shipments, which was done so they have food this year. This will afffect the entire world markets. How about the smoke-it is so large an area, it can be seen from space and it will be here in the western USA soon. The floods-where will the aid come from? A country like the USA in a midst of a depression or muslim aid organizations? Then these people will turn to them as a leader. Everything is connected, and the next thing for us will be similar situations, we will have third world electric power, third world transportation, and not enough food. In our case it will be because the wealthier elements of society have too much money and the rest too little, and those who can will hoard. We are laying off teachers so fat cats can stay in power. We live in a fish bowl, and with 6 billion people, we have over-populated the planet that suports this species. Al Gore may have had parts of the future scenario wrong, but this series of events is what I expected all along-severe and extreme swings in the climate and regional events which undermine the fabric of an over-industrialized society which is over-dependent on oil and coal. By the way, with this kind of weather situation, large solar and wind farms are NOT the answer. Large centralized power systems interconnected by the grid are doomed to fail-the first big weather event will put them out of commission. Distributed and local power generation is our only choice. Mahatma Gandhi's perspicacious prediction based on scientific analysis in 1908: Given enough time modern civilisation(mc) will destroy itself. Because mc is based on imperfect knowledge that things are separate and not interconnected. On the other hand sages on the Indian Subcontinent saw the truth that things are all rigidly interconnected in nature and accordingly designed a way of life as enunciated in the Gita. Production, consumption and return was the norm of what we may call a normal civilisation. In harmony with nature this ensured that India supported a huge but constant human population of 100-140 million for at least 4000 years till 1850 AD. Come mc's depredations and India's population swiftly rose to a billion and is still increasing with mc's antics of growth, growth and growth in one dimension-money, whatever may be the externalities. Destroying forests which ensured harmony, man converted groundwaters to surface waters via dams to meet the greedy need for water. This is causing an accumulative effect on mother earth in the form of enormous waves of changes in water pressures at the centers of gravity of heavily dammed regions of the order of hundred kilometers per second! These are causing Love and Raleigh waves to travel along the earth's crust resulting in enormous frictional heat between blocks of rock to cause climate change and earthquakes in a positive feedback to the earth's intrinsic control mechanism to make tornados,cyclones,heat waves,landslides,rains, floods and earthquakes! When we went to the Valley of Flowers in the inner valley of the Himalayas near Nanda Devi this past fortnight, we had to pass through a wave of landslides cleared by our dear Border Roads Organisation as quickly as it was caused- precarious delays and anxious moments! But not so lucky were the visitors to Ladakh! Nor the Pakistanis or the Chinese nor the Europeans caught in the grip of self made interconnected disasters. The way out is normal civilisation where thrift is the norm not aggrandisement and greed and lust for irrational living with the Midas touch. See the complete profile of me by clicking on my name on Google Search and see a sense of the interconnections as revealed by data on the ground. CNN mentions 9 dead in Poland, Germany and Czech, but they don't mention 4 dead in Lithuania. Why ? we r accelerating the freeze thaw cycle that the Earth goes through. Which means we are also welcoming the next ice age to come in quickly...i dont think we have the resources to tackle tht! How much more proof does one need of climate change? How can humanity be so stupid to reduce the arguments about climate change into only 2 categories. The one says global warming is soley attributed to natural phenonema, the other says global warming is caused by mankind. Another way of putting it is to say, one argues " you have a right hand", the other counters with " you have a left hand". I believe most of us have both left and right hands. Is it not possible that there is a natural cycle warming the earth and that billions of irresponsible humans exploiting the earth are exacerbating a natural phenonema? There have always been natural cycles, but that does not mean that humans are not adversely affecting our environment and thus our climate. And you know what is really funny? We were all warned....and everything- from every school, hospital, bank, home, snack bar, restaurant, Wall Street, baseball field– are all built on the earth. The earth is a living organism. What lives can also die. "(global warming is) some kind of tricky campaign made up by some commercial structures to promote their business projects." "practically everything is burning. The weather is anomalously hot. What's happening with the planet's climate right now needs to be a wake-up call to all of﻿ us, ...in order to take a more energetic approach to countering the global changes to the climate." This is all natural. The engine behind this is locally speaking the Sun. But the we are also influenced by the coming passage through the galactic plane. Current civilisation knows nothing of movements of this scale. But if you are willing to open up your eyes, you will see. TPTB will have you believe that mankind is responsible – if it were so then THEY only are responsible with their unnatural technology. But this is just hybris. Man has nothing to do with this and cannot affect it either. Seek shelter and hold on to your hats, it's gonna be a rough ride. Oh, common, this isn't the place for us to be driving conclusions out of pseudo-scientific mambo-jumbo, specially being the most people here (though having no facts, I'm certain) only curious about the subject, not exactly scientists or alike. Let us not driven rather irresponsible and stupid conclusions based on what we still don't know yet. It is time to careful deliberation and scrutiny rather than reckless action embroiled in pseudo-scientific crap. If this phenomena are indeed connected, what I'm saying gains even more force as it demonstrate how our reckless actions have triggered some devastating consequences. Let's be rational once in a while, is that ask for too much? I believe it's connected. And no matter where one stands on the issue, the technological pursuit for cleaner air is a rapidly expanding "industry" with enormous financial and job-creation potential: and the USA is falliing behind in the research thanks to the stubbernness of demagogues. When Moscow that has had max-maximum 32 degrees Celsius in last 100 years, and on average 26 degrees over the summer, suddenly has 40 degrees for weeks that cannot be defined as random. It is just the planet Earth trying to set back the equilibrium. This scenario had been happening several times throughout the history, when a volcano had erupted, for example. And our industry has been one very large slowly active volcano in last 100 years that has emitted gases and raised temperature. The Earth is going to defeat us at the end ether by forcing us to change our habits or by reducing our ability to live the way we are used to. It's our choice. The point of my notes are this. We embarked on the structure of a "global" economy based on some very inaccurate assumptions. Take air travel-how long can we support jet travel when dirigables and prop planes are way more efficient. What happens when we run out of or jet fuel becomes more expensive? Grow biofuel? What happens when that crop is dimished by weather events? Too many variables here to manage. So travel by car, by boat, by train, and other modes will get more expensive and globalization, without another completely different fuel source will disappear. Globalization was based on unlimited energy use. Not feasible. So we begin to think local and that brings about a whole new set of variables. But these are at least managable if we do not think in terms of mega-corporations and get back to basic business-supply and demand. All electrical power must be local, no utilities with fortune-500 profiles and rich management pay-scales. No making cheap products in Mayasia or India and sending them to the USA-too expensive. We must make our own energy, make our own food (at least locally) and make our own local industries thrive-that is how we survive climate change and add jobs. 401k's-a thing of the past. Cushy pensions and $500,000 a year city manager jobs-gone. If we recognize that we hav been living a lie for over a hundred years, we can get on and get past this crisis. A definition of insanity: doing the same thing over and over expecting a different result every time. Mr. Obama-I suggest you make note of the real situation, not the one you want to see happen. America needs ot be a mega-power WITHOUT using too much of everything. We are next in the sights for extreme weather. I think the doubt about GW is simply people saying what they want to hear. I'm 43 and recall as a child learning about GW. Think of the concept – pump a bunch of insulation into the attic of your home and keep on adding to it, then change the color of your home from white and (green that absorbed solar energy) to black. What's going to happen? This is the defining challenge of the next 50 years. Hang on tight, b/c people will scuba dive in New York City in my lifetime. Is the climate changing? Maybe. Is it man made? Absolutely not. Is there anything we can do about it? Absolutely nothing. Any sense of control anyone has over their own life is merely an illusion. Whether or not the humanity is to blame for the weather change, the only way to reverse it is either to move everybody to live in tents, or continue developing technology so it can solve climate ot other problems. If we don't exist, we don't affect the weather. Humans will inevitably change their environment for better or worse. It has been happening for milleniums. I don't believe people should consider themselves generally irresponsible. If trees and rivers have their needs so do the humans; and there is lots of us to make a dent. One other reason for all the global "catastrophes" is availability of information. We know more than ever due to the Internet and global news coverage. That does not necessarily mean there is more stuff happening. When it really does, we'll know. The Earth is sick people and we are the virus.....when her immune system kicks in she will wipe us out or at least down to a managable level.......we can't keep doing what we are doing.....but keep living in farmville on facebook just so your monkey mind doesn't have to deal with it! My heart goes out to all that are suffering. There will be more suffering to come. The Lord said that these days would come check the HOLY BIBLE. We must check ourselves spiritually, repent daily and relax my friends the Lord Jesus is at hand . . . so relax it's only hell brewing. I agree that these extreme weather events are all conected because you only have to cross check the suns activity over the last 3 and a half years with global average temperatures to make that conection. Every year got steadily hotter whilst the sun was at or near maximum. Then when the sun went into an extremely low minimum, not suprisingly it was noticably cooler. Now the sun is heading back toward maximum, this year has seen a dramatic increase in solar activity and therefore I would expect global temperatures to be on the increase agian. Its not university mathematics, its quite simple to see the conection. The Club of Rome Members (1958!!) warned in that very year that we will see a full blown weather cathastrophe by the year 2000. The Sicentist Rudolf Steiner (1861-1925) warned in 1925 that we will see the end, if industrialization continues at the pace of 1925!! Are we all kidding ourselves? It is astounding how many crap-heads we have at the helm of most countries....! 200/9 gave us a clear signal: no more growth: go for quality (of life etc.). Yet, we push for more growth..... –> and, like lemmings, we are jumping over the cliff. Has anybody heard of Bio-Dynamic Farming? Well, here is a method that changes things -chemicals, fertilizers, sprays good bye. And, as Steiner said: if we continue further on the linear path – remember, the cliff is going to be steep. Weather is climate when it is convenient to the environmentalist cause for weather to be climate. Weather is not climate when it is convenient to the environmentalist cause for weather to not be climate. Its really that simple. For environmentalists, truth is whatever gives them power and money. Period. I agree with Dominic. It is MOM's way of getting rid of a bad virus. She's done it before, she'll do it again. I love how even despite this article and what is happening around the globe people such denis and many others believe it to be a hoax, sighting such nonsense as "we used to think the earth was flat"
Global warming is man made, we have been burning off most of this planets natural "resources" for the past thousand years as well as putting toxins including manmade chemicals into the enviroment. These things are common knowledge that everyone knows and most would rather deny it because it means the end of humans. It has already been proven that even if all humanson earth suddenly disappeared from this planet it would take thousands of years before all the waste we left behind would dissipate. Becuase of this "changing what we do" as many people have said will do nothing to fix the damage that has already been done nor the damage that will be done from all of our waste over the next millenia if we do somehow find "a clean energy source." What I find disturbing in terms of extreme weather and research is a correlation that is occurring between extremely abnormal and destructive weather and weather research, weather computer modeling and experimentation, and environmental monitoring and remote sensoring, and weather modification research that is being done to both model and be able to create through artificial means, the extreme weather conditions that are now occurring. Massive amounts of weather, climate and environmental research and experimentation is now being done and the largest supercomputer in the world, Japan's Earth Simulator, is now being used to track remote sensing monitors around the world and crunch vast amounts of weather and climate data that is necessary for weather modification. In looking at the areas of weather and climate research and monitoring and remote sensoring and satellite and computer capabilities, the extremely abnormal weather and climate have been following the increased capabilities in weather modification and weather monitoring and modeling and it appears related. The difficulty here is that "extreme events" will, inevitably, happen with some probability...and, with some probability, there will be clusters of them in any given year/period/season. We do have a propensity to see clusters of events as being, somehow, causally related even if they're not. Perhaps that's what's happening here. BUT the difference here is that a large body of climate science provides a clear basis for predicting such events, and with increasing frequency–thus apparent clusters. How many such extreme events do there have to be in order for it to count as a prediction from such science? For my taste, we'd be very foolish not to take very seriously the possibility that the cluster CNN points to does exist as something real (as opposed to random) and for the reasons climate scientists argue. I grew up in Southern California and normally we have several weeks of sweltering temperatures during the summer but nobody is complaining this summer because summer temperatures have been 10 degrees below average (according to available charts). I'm not complaining, mind you, but it's very odd. The cost of damage due to flooding exceeds the costs of fire, earthquake and epidemic combined. Yet it's the least prepared for disaster. theres no way to stop global warming it would have too big an effect ecconomic effect . to slow it we would have to swtich completly to nuclear power . perhaps even make global warming denial a serious crime . theres really not much time left might as well enjoy what we have . i m 45 i think i should get through my life with a little luck without seeing the cataclysm thats coming . Man-made is the last of a long line of explanations. And here again somebody comes with the same old 'Solar sun spots' theory to deny the science that is climate change. Folks 'Sun Spots cycle' has been there forever and yet the heat wave in Russia- as Russian president put it- is something Russia has never seen before- not in last hundred years! Its all happening and at alarming regularity. Last year in Karnataka in India, floods happened in areas at a scale not seen in an century. Sun Spots and the solar cycle has been there but never before have we seen such an alarming regular chain of weather events. Sun Spots is just one another argument to deny the science as was done at the times of copernicus. Welcome to the hot crowded world as a wise man told. Time to change has come. OK, God has never Not kept his promise to the world, how much more has science failed us??? so called smart people of the world . . . what are the results of your gods and beliefs? Has not the Holy Bible's words been tried and true? What are we still in denial of hell???? When the "Moment" arrives that we all come to the same conclusion that the WE in fact are the infestation on Mother Earth and she is getting rid of us, it will be too late. Oh well, this beautiful Blue Planet and all its amazing fauna and flora is clearly better off without us reckless greedy humans and our messing it up, anyways. Let's drill another deep ocean oil well where we take 3 months to plug a major leak, shall we? Nobody can still deny that this weather events are connected and are only the gentle beginning of that what will come in the next years. It is now too late to prevent what will come, people should have reacted decades ago already, then it would not hit us as hard as i think it will. If now the World does not come together and finally, FINALLY reach a binding reduction, a massive reduction then in 100 or 200 there will be no more mankind. For many other species it is already too late anyway. I am just glad that i am over 40 and do not have kids who have to live in the world that comes after the next 30 to 50 years. Only if the last tree is cut, the last fish is catched and the last deer is hunted mankind will learn that they cannot eat money. Then it will be to late, i think it already is. I left my comment. can not say anymore.I have my reasons. Doomsday scenarios are not necessarily true ,but CNN for example could keep close focus on areas sensitive to volcano eruptions. If numbers of eruptions increase dramatically (pfu pfu better not!) in coming months, then inevitable changes already in progress. Next step would be to plan and start organize rescue missions to help affected countries. That could be big challenge but a must to do. Someone should check out HAARP. It could be some of their scientist playing around with the equipment. Global warming, I am curious about something, could it be solar activity sunspots warming up the earth. Things just do not happen overnight, the Iceland ice cores show that. Our solar system, meaning our sun and its planets is going through a transition in our galaxy, moving from the bottom part of the galaxy to the top part of our galaxy. Our sun is moving with its planets dead center, of this galaxy spiral we are in 2012. It could cause a lot of things to occur, sun polar magnetic shift and on earth which is happening now causing climate change and causing volcanic activity. And there could be a lot of other things happening beyond human comprehension causing global warming. Humans could be causing some of the warming. With humans ability to come to conclusions and other humans around this planet see an opportunity to manipulate things making a lot of money. NO I’m not 2012, doomsday person. @Alejandro – very well said, I agree. WE NEED A REVOLUTION! We need to stop enslaving our workforces and we need to act together, otherwise no one else will.We need to change our capitalistic ways of living, adopt resource driven economies, where loans, debt and money have no place. We need to implement strategic solutions to combat climate change that have a positive effect during our every day lifestyles. What happened to the water car. I heard oil companies bought out the rights. Where is the policy for human good. What about rollercoasters, I heard the technology is very advanced and who wouldnt want to go to work on a rollercoaster. Transport is our main issue. Such drastic changes may buy us a few extra years in turning the climate back in the right direction. What about pollution regulations, such as fuel limitations per capita, or per country. I am glad energy companies are tapping into these alternative energy sources. This is a good move. GEOTHERMAL! I think once we adress theses more important issues then we can move on to more collective methods in fighting climate change such as in our everyday routine, for instance...beneficial recycling, power saving methods and power saving electrical equipment, regulated air-condtioning, forestation, and eventually reducing all domestic heat by employing various schemes or new technologies. I'm with you Dale on evrything you said.I am also not a 2012 doomsday person as everyone perceives it to be however, the solar system is exactly what is happening right now.Remember being in school everyone, and learning that theb sun evaporates water from our lakes, and turns them into clouds?Well, should I continue for those of you who can't figure out the rest? This solar Cycle will be the worse anyone of us has seen, and it is proving that now.The hell with global warming, that is just a big cop-out, the realitry of it all, is our solar system, and it is going to get worse from here, mark my words.Watch New Orleans get another Katrina. El nino is a few degrees warmer than what it should be.May not sound like much to most, but very severe for those who understand it. It's counterpart la nina in the pacific, is giving the west coast record low temperatures,....some in the low 50's, and that's in the summer time.This never happens.We are in for a rude awakening people if the solar system is to do what scientist think it will do.Watch the video, "Attack of the sun" on you tube, it will explain it all for you, including the blackout of 2003 in Eastern North America. This will be worse than that.WATCH THE VIDEO!YOU'LL BE GLAD YOU DID! Global weather chaos is certainly connected. The solar cycle and Earth's cycles are closely related. For those of you who disprove the notion that the sun's sunspot cycle doesn't have anything to do with climate change here on Earth, please read up on the period of time referred to the "Maunder Minimum." During this time, solar activity was at a minimum for an extended period – and guess what? Earth went through a "mini-ice age" period. Earth is constantly changing. Always has, always will. As a species, we can lessen the load we put on Earth, but it will continue on its cycle just as it has done for the past 4.6 billion years. There is no doubt that has to do with golbal warming. As the ozone layer is being destroyed, the sun's deadly rays are now breaking through our last hope of protection and are heating up the planet. With more heat, not only are the ice capsules melting at faster rates but also more heat is giving greater power to hurricanes and storms. It's time people stopped denying that global warming exists. Because if things continue the way they are we can only hope that our kind will learn to adapt to a harsh unforgiving new world. It is undeniable that climate change is happening – we are likely past the tipping point. You know I don't think global warming really but this is some strange weather. Global warming may be a contributor. But even global warming, I believe, is a result of something bigger. It is the opinion of many (and it is an opinion that I share) these things are cyclical and that we are coming to the end of a cycle. Perhaps our lifestyle - the choices we as the world population have made and continue to make - can be attributable to the ferocity of the situation, but something of this nature was bound to happen. Actually, according to those scientists who study earth cycles, it is overdue. I do not believe that we will be able to correct it with "human wisdom." I think that the only thing left for us to do is to humble ourselves and learn to pray. Obviously, the earth is getting warmer as displayed by the melting of massive polar ice caps. Scientists have issued warnings for years requesting global leaders to address the issue. It is unfortunate that weather patterns have reached such critical proportions without so much as a whimper from our leaders. Is not time for fatalism. Bad Fred's idea, bravo Ferdinand. Before of Club of Rome was Prof. Vernadsky who in 1925 predicted to save our Planet, before was Dr. March, 1861, too... It's time to respect the limits. I think the key point that must be considered is the rarity and relative newness of certain events included here. Wild fires in Russia? I've been reading the NY Times, the source where one would be most likely to hear of such an event, if, say, it wasn't as major as this one, for about 12 years and I do not recall EVER having knowledge of a deadly wildfires or any wild fires in Russia, really, until now. Oh, wait... it must be the liberal media conspiracy newly covering such normal occurrences with the intention of supporting the global warming hoax. Yep...that's it. 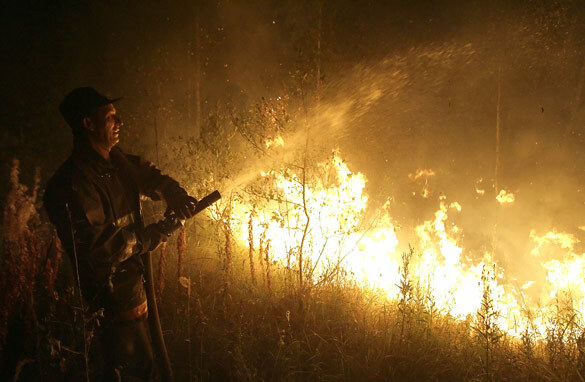 Highly destructive wild fires are probably common in Russia. Nevermind.